If you struggle with bouts of depression and low self-esteem; feel ashamed or guilty or hopeless at times, our work with the Inner Critic can open up new vistas for dealing with these issues. The Inner Critic is the part of you that judges you, demeans you, and tells you who you should be. It undermines your self-confidence and makes you feel bad about yourself. 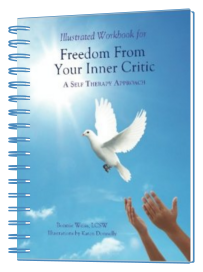 Since this is one of the most difficult and tenacious issues that people face, we have written Freedom From Your Inner Critic and this companion Illustrated Workbook to show you how to transform your Inner Critic using the Internal Family Systems Model (IFS). Based on IFS, a powerful form of psychotherapy, our work can help you put an end to your painful feelings and grow into the person you’ve always dreamed of being. The surprising and wonderful news is that many people can achieve this transformation on their own, without the intervention of a psychotherapist. It’s time for your suffering to end because you can transform your life. This Workbook is a companion to Freedom from Your Inner Critic. It contains delightful illustrations of the Inner Critics and the Inner Champions that can be developed to work with them. It facilitates the processing and integration of basic concepts of our Inner Critic work and IFS. It presents thoughtful questions, imagery exercises, and drawing experiences to aid learning. It is appropriate for ages from teens to adults and can be used in groups, classes, or individually with a counselor or therapist.